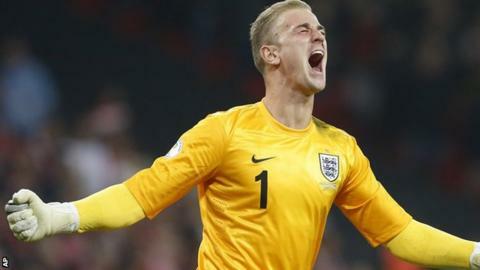 Joe Hart is not one of the world's elite goalkeepers, says ex-England number one Peter Shilton. But the 64-year-old, whose 125 England caps between 1970 and 1990 have never been surpassed, believes Manchester City's Hart, 26, can reach that level. "I don't think he is quite at the top at the moment because he is still young and, as we have seen this season, he is prone to mistakes," said Shilton. "But he has a lot of natural ability and I like his confidence." Barring injury or a severe slump in form, Manchester City keeper Hart, who has won 39 caps, is likely to face Italy, Uruguay and Costa Rica in the group stage of this summer's World Cup in Brazil. Despite losing his place in the City side to Costel Pantilimon following a dip in form earlier this season, the former Shrewsbury stopper started all of England's qualifiers. Shilton believes those weeks spent on the bench at Etihad Stadium prove Hart is not yet ready to be considered at the same level as Germany's Manuel Neuer and Gianluigi Buffon of Italy. "At the moment he has been making too many errors, especially when he eventually fell out of City's side during a crucial period," said Shilton. "He still has a lot of improvement in him. When he has a couple of consistent years, you could start to say he is up there with the best in the world." With three goalkeeper berths making up England's 23-man squad for Brazil, manager Roy Hodgson has to make a decision about Hart's back-ups. Two of the leading contenders - Celtic's Fraser Forster and John Ruddy of Norwich - have only eight caps between them, and that is something which worries Shilton. "There have not been a lot of games for the kids underneath Hart," he said. "I think between now and the World Cup, Roy will look to give full matches to them, just to get them in the routine of playing for England. "There is not much time now, Roy has to start playing what he considers to be his best team. It is a worry but I think he will give West Brom's Ben Foster a full game and he is good enough to start keeping Joe on his toes. Hopefully that will create more competition."